Life cycle of the malarial virus, Plasmodium vivax. The virus, once transferred to a host human through a carrier mosquito, enters hepatocytes in the liver as a trophoziote. Within an hour, the virus can produce hundreds of daughter cells asexually. Image from [Wikipedia Commons]. Malaria is a disease that infects the red blood cells of mammals, and is currently responsible for killing over 1 million people every year. The disease primarily affects people in warm or tropical locations such as southeast Asia and Africa, where its carrier organism, female mosquitoes, can thrive. Malaria, which was [first reported] in ancient China, is transmitted through protozoan parasites of the genus Plasmodium. The two major species of Plasmodium that infect humans are Plasmodium vivax and Plasmodium falciparum. While the first is responsible for the most malaria cases in the world, the second is the cause of most malaria related deaths due to its higher mortality rate. Infection by Plasmodium viruses is divided into two stages the exoerythrocytic cycle, depicted to the left, and the erythrocytic cycle. While the virus can lay dormant for one year or longer, the exoerythrocyctic cycle can progress rapidly, in a matter of weeks. After reproducing asexually in hepatocytes in the liver, the virus will eventually rupture the walls of its host cell and begin to infect red blood cells. To read more about the disease, visit either the [CDC's webpage] on Malaria or [Wikipedia]. Artemisia annua, a common wormwood found in the temperate province of China, Hubei. Image from Wikipedia Commons. Artemisia is a genus that encompass a broad range of plants commonly known as sagebrush, sagewort, and wormwood. The family, which derives its name from the either from the Greek goddess Artemis or Artemisia, the wife of Mausolus, includes many plants. Artemisia absinthium is used in the production of Absinthe, and Shakespeare employed wormwood as a cure for the love potion in Midsummer's Night Dream. One species of Artemisia, known as Artemisia annua, has been used for thousands of years in traditional Chinese medicines to cure headaches. This last species is of particular interest to synthetic biologists, due to its ability to produce Artemisinin. As a result, much of the species' genes have been characterized and submitted to the Gene Bank. Artemisinin, or Qinghaosu, is a chemical compound produced naturally by the plant Artemisia annua. It is a sesquiterpene lactone, a type of terpene derived from 3 isoprene units and a lactone ring. The compound is unique, as it contains an oxygenated cyclic ring with a peroxide bridge, and contains no Nitrogen atoms. It was first derived from Artemisia annua in 1971 by Chinese chemists interested in observing the plant's supposed use in curing headaches . In response to the Chinese government's push to develop new malaria cures, malaria patients were treated with this compound. Fortunately, it was determined to be very effective at combating common malaria strains, including those resistant to the traditional antimalarial drug chloroquine. Currently artemisinin and its derivatives are employed to combat the malaria strain P. falciparum. In 2011, the highly prestigious Lasker DeBakey Clinical Research Award was given to Youyou Tu,the principle investigator from the Institute of Chinese Meteria Medica, China Academy of Chinese Medical Sciences whose team first discovered artemisinin in 1969. Her team was engaged in project 523, an attempt to screen over 2,000 traditional Chinese medicinal cures for potential use to combat malaria in the tropics of Vietnam . Later tests in humans infected with malaria indicated that the drug worked so well within hours after application, that many individuals would discontinue use. Unfortunately, this lead to recrudescence of the malarial parasites, requiring new application of artemisinin. The discovery of artemisinin by Dr. Tu has been talked about as a possible nominee for the 2012 Nobel Prize in medicine. Artemisinin posses antimalarial capabilities due to its trioxane ring structure. It is capable of killing the malaria parasite while infecting human red blood cells, and even proved effective on strains resistant to commonly used antimalarial drugs. Unfortunately, the ketone group on the bottom of artemisinin, shown below, imparts negative characteristics. In its native form, artemisinin has low solubility in both water and oil. This makes the compound difficult to produce and distribute, and led to the development of its multiple derivatives shown below. Note the expansion of the ketone group on the bottom of artemisinin in successive derivatives, which contribute to their increased solubility and potency. Until recently, there was no known resistance to artemisinin in malaria parasites. However, a report released in April of this year identified over 30 areas of Plasmodium virus' genomes that are being actively selected for through use of artimisinin based anti-malaria treatments in southeast Asia, and Thailand in particular. Another study realeased in April of this year reports that artimisinin resistance in P. falciparum developed at least eight years ago in the western border of Cambodia, and could potentially be spreading to Myanmar. This has sparked an international effort to contain the disease, as the report predicts that the disease will proliferate to new regions of the globe within 2-6 years at its current rate. The authors note that "the genes responsible are unknown", although the genes provide artimisinin resistance to the parasite while in its ring-phase. Previously, one of the most widely used antimalarial drugs produced was chloroquine. While successful at combating malaria, chloroquine exhibits multiple adverse side effects, most notably Pruritus. Pruritus is a particularly uncomfortable form of itching sensation that dark-skinned individuals are more susceptible to, due to their increased melanocytes and the pathway in which chloroquine binds to these melanocytes. This condition can be so painful that multiple drugs must be administered in unison with chloroquine in order to negate its detrimental side-effects. Considering that malaria generally plagues the poorest 20% of the world's population, mainly located in countries in Africa, the cost-effectiveness of this procedure can make it impractical to implement. In general, chloroquine is now used exclusively to treat malaria patients infected with the Plasmodium vivax strain, and chose preferentially of artemisinin in order to prevent development of drug resistance. Artemisinin is still the preferential drug for use on the malaria strain Plasmodium falciparum, in which drug resistance to chloroquine is quite common. It suggested that, due to the rise of chloroquine resistance, it may be beneficial to apply artemisinin-based combination therapy drugs to patients suffering from either strain of malaria. Ro et al. 's procedure for converting carbohydrates into artemisinic acid in S. cerevisiae. . Proposed mechanism for the production of artemisinin in Artemisia annua. . In a paper released by Ro et al., Saccharomyces cerevisiae was engineered to produce artemisinic acid from simple sugars. This involved metabolic engineering of the mevalonate pathway, naturally present in S. cerevisiae, to introduce a three-step pathway that converts amorpha-4,11-diene into artemisinic acid. The first step of this process involved engineering the yeasts' natural mevalonate pathway to produce increased levels of farnesyl pyrophosphate (FPP). 3-hydroxy-3-methyl-glutaryl-coenzyme A reductase (tHMGR) was over-expressed in S. cerevisiae by introducing another copy of the gene encoding for this enzyme, leading to increased mevalonate production by fivefold. Additionally, the mutant allele upc2-1 of UPC2 from plasmid pBD33 was introduced, leading to moderate over-expression of various ERG genes responsible for the production of enzymes in the mevalonate pathway. S. cerevisiae naturally employes mevalonate to produce sterols. Ro et al. 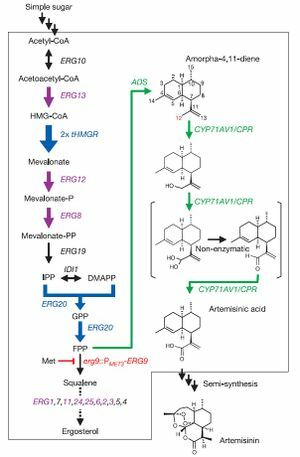 therefore introduced a methionine-repressible promoter to down-regulate the enzyme-encoding gene ERG9, responsible for the conversion of mevalonate into squalene. Natively, S. cerevisiae contains no pathway to produce any form of artemisinin or its precursors. Therefore, Ro et al. isolated the genes encoding amorphadiene synthase (ADS) from Artemisia annua, and introduced them into S. cerevisiae. Alone, this step led to low levels of amorphadiene. However, combined with the steps mentioned above, significantly higher levels of amorphadiene were achieved. Finally, Ro et al. isolated the genes responsible for converting amorphadiene to artemisinic acid in Artemisia annua and introduced them into S. cerevisiae. First, a genomic analysis of plants in the Asteraceae family was performed to determine common ancestor enzymes. It was determined that cytochrome P450 monooxygenase from sunflower and lettuce were compatible, and P450 gene fragments were obtained from the Asteraceae EST-database. A cDNA library of P450 fragments was created using random primers specific to CYP71 Asteraceae subfamily, and BLAST analysis was employed to determine the conservation of P450 gene across the entire Asteraceae family. The BLAST analysis determined that the P450 gene was an acceptable candidate for introduction into S. cerevisiae. The isolated P450 cDNA encoding for CYP71AV1 was then incorporated into S. cerevisiae. 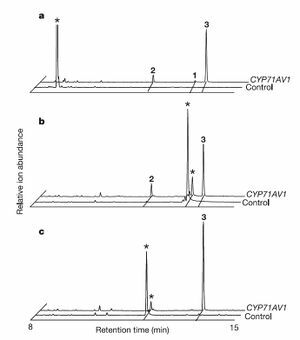 For stability of this CYP71AV1 enzyme, cytochrome P450 oxidoreductase (CPR) was also isolated from Artemisia annua and introduced into S. cerevisiae. This allowed for an effective 3-step oxidation pathway to convert amorphadiene into artemisinic acid. Ro et al. 's determination of the optimal S. cerevisiae for producing artemisinic acid using their methods. 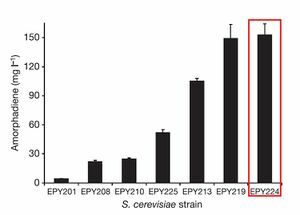 Strain EPY224 was determined most effective, and used throughout their experiments . Tests to determine whether or not the CYP71AV1/CPR combination of enzymes worked effectively or not in converting derivatives of artemisinic acid into the final product. Control groups expressing solely CPR were compared against the combination of both enzymes. Amorphadiene (a), artemisinic alcohol (b), or artemisinic aldehyde (c) were given to both yeasts to see if they would convert these derivatives into artemisinic acid, the furthest peak to the right . In vivo tests were then performed to determine whether this engineered S. cerevisiae was actually capable of producing artemisinic acid. Results of growth tests indicated that high levels of artemisinic acid were indeed present, and actually attached to the outer cell surface of the yeast cells. This allowed for easy recovery of plentiful amounts of artemisinic acid. The results of Ro et al. 's work was the ability to rapidly produce high levels of artemisinic acid. The yeast engineered in this study were capable of producing 4.5% dry weight of artemisinic acid, roughly 3.5 times the productive levels of Artemisia annua. Additionally, the S. cerevisiae completes a full growth cycle in roughly one week, while Artemisia annua requires multiple months to grow completely. Although the authors did not actually perform a detailed cost analysis of their method of producing artemisinic acid, they did point out in the supplementary material of their report that this method could be used to produce artemisinin at costs "significantly below current prices". 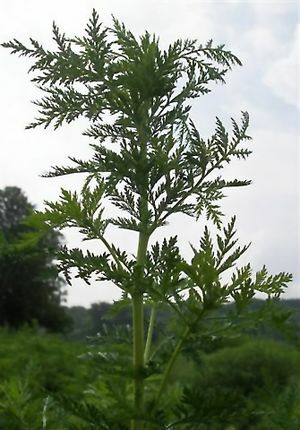 It is noted that total chemical synthesis of artemisinin is costly, as the previous method for creating artemisinin was to grow complete crops of Artemisia annua and harvest the drug from its leaves using alcohol extraction. It is worthwhile to note that the process by which artemisinic acid is converted into artemisinin is currently under debate, as "...how artemisinic acid transforms into artemisinin is still under investigation" . However, multiple processes by which artemisinic acid can be converted into artemisinin have been suggested, all of which employ Oxygen in the air as the reagent causing the conversion. It has been shown that the conversion of artemisinic acid into artemisinin appears to be the rate-limiting step in the production of artemisinin in Artemisia annua, suggesting that improvements can be made in this mechanism. The World Health Organization aims to incorporate artemisinic acid based pharmaceuticals to combat malaria on a much larger scale than previously used. The organization condemns the use of mono-therapies using solely artemisinic acid, as the fear that parasites resistant to artemisinin is very high. Since 2005, the use of artemisinic based combination therapies (ACTs) has increased from less than half of malaria cases in 5 African countries to between 50-100% in 19 African countries. The biotech company Amyris was co-founded by Dr. Jack Newman, one of the authors of Ro et al. 's 2006 Nature paper, and is now heavily involved in mass producing artemisinin from artemisinic acid in yeast under a grant from the Bill & Melinda Gates Foundation to the World Health Organization. There has been no incidence of previous iGEM teams investigating artemisinin or any of its precursors. Many iGEM teams have referenced Ro et al., but only as an example of pathway engineering, or in order to discuss ethics and synthetic biology's potential to positively benefit society. No parts in the parts registry deals with artemisinin either. Only one [set of parts] mentions a protein, Granulysin, which can potentially be used to fight malaria. Investigation of further applications for artemisinin and its derivatives could serve as a novel area of research for future iGEM teams. Lancet report on the state of Malaria worldwide, from 1980 to the present. Early review article that details the development of artemisinin and its derivatives for antimalarial drugs. Relatively new review article on artemisinic acid and its derivatives. Follows the discovery of artemisinin by Youyou Tu. Besides having the funniest last name of lead author ever, this paper identifies certain genome locations that are currently being selected for by artimisinin based drugs. Confirms the presence of artimisinin resistance in western Cambodia. Study from the University of Benin that explores the detrimental side-effects of chloroquine, particularly Pruritus. Discuses the use of combination therapy using Artemisinin and supplementary drugs. Widely referenced Nature article from the Keasling lab in UC Berkley in which the researchers were able to produce artemisinic acid in S. cerevisiae at levels over 100 times that produced naturally in Artemisia annua. 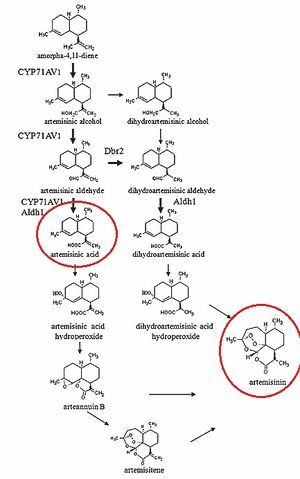 Reviews the biosynthetic pathways for the synthesis of artemisinin in Artemisia annua. Suggests multiple possible pathways in which artemisinin might be produced from artemisinic acid. Notes that the rate-limiting step in the chemical reaction for artemisinin production is the conversion from artemisininc acid. This page was last edited on 30 April 2012, at 07:43.